Home security will indeed be better when you know when the entry points like doors and windows are secure, right? Fortunately, securing the entrances of your home is actually better nowadays. All thanks to the evolution of smart home technology. With the help of small devices we call smart door and window sensors, you’ll be able to monitor whenever doors and windows are opened. The best thing is you can check on it even if you’re away from home or wherever you are. As one of the leading home automation technology, Z-Wave enables door and windows sensors to become smart enough to provide these features to you. So, allow us to introduce to you the Z-Wave door and windows sensors. And, we’ll show you the best Z-Wave door/window sensors available in the market today and how these smart sensors can enhance your security and convenience at home. How Does Z-Wave Door/Window Sensors Work? Door and window sensors can provide beneficial things not just to your home but to your experiences at home. These small smart devices can improve your way of life at home. The two most important aspects of life at home that smart door and window sensors provide are security and convenience. Door and windows are the main entrance points in every home. And so, anyone or anything can pass through these entry points of your house. We know that having dangerous or harmful elements access enters is a threat we hope won’t happen to anyone. With that, it is extremely important for anyone to secure these entry points at home. With Z-Wave door and window sensors, you’ll have the capability to monitor if a door or window is open or close. Not just that, the moment it opens, you’ll get notified through your smartphone application or any other smart device like smart sirens. Imagine the power you will have to be able to stay ahead of securing your home. Aside from improving home security, smart door and window sensors can also provide you more convenience at home. Think about the possibilities when you’re smart home system knows the moment you open the door or window. With other connected smart devices, you can program you’re home automation system to do some things like turn on the lights if it’s nighttime. And even more, the system can turn on the air conditioning system when you enter the house. These are just common examples how you can benefit or take advantage of these Z-Wave smart devices to improve convenience and experiences at home. There are plenty of factors when someone buys something. In the same case, you might have different considerations in choosing a Z-Wave door or window sensor for your home. They maybe the price, durability, compatibility with your existing devices or the features which you are looking for to satisfy your needs. The factors we are considering maybe different than what you are looking for or any other person. Whatever it is, we hope that the data that we have presented here will help you better decide which one of these Z-Wave door and window sensors will best suit your needs for the smart home you are building. The Ecolink Intelligent Technology Z-Wave Door/Window Sensor is our choice for the best Z-Wave door/window sensor for several good reasons. First, the price is way cheaper than its nearest competitors. Not only that, it can provide you with the needed open/closed status reports for the doors and windows of your home. Aside from that, it also notifies your smart home system if there is tampering of the sensor when its cover is opened. Created by Ecolink Intelligent Technology, this smart door and window sensor features an industry leading Rare Earth Magnets which allows to have a grap of up to ⅝ inch. This gap allowance gives just the perfect flexibility to cater commercial windows and double hung windows. The package comes in with two colors which are white and brown plastic casing which can match light and dark colors for doors and windows. Aside from sensing open and closed status of the entries at home, it can protect itself from tampering through notifications whenever its cover is removed. The sensor has a 3V Lithium CR123A battery which can support operation of up to 3 years with 50 openings/closing per day. It can operate with range of up to 100 feet line-of-sight with your smart controller. And, it operates at a temperature range of 0 – 49 degrees Celsius or 32 – 120 degrees Fahrenheit. In terms of installation, you have to determine the position where you will install the sensor in your door or window. Install magnet relative to the sensor through the line and arrow in the sensor. The sensor is typically installed in the non-moving part of the door or window while the magnet is on the door or window itself. There are 2 ways of mounting the sensor and the magnet which are through the adhesive tapes or through the use of screws. Make sure that the surface where you’ll install the magnet and sensor are flat and clean. Lastly, make sure the orientation of the magnet and sensor relative to each other is correct before you will start with the mounting. Refer to its installation guide for more detailed steps. Lastly, since it needs to pair a Z-Wave controller or hub, it can be assuring to note that it is compatible with most brands of Z-Wave smart hubs. 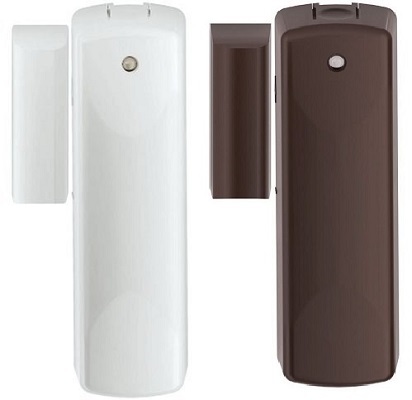 This Z-Wave door and window sensor from Schlage Lock Company provides you the power to monitor remotely the status of the doors and windows at home. Although this device is built to work in partnership with Nexia, many users have used this with other Z-Wave controllers like Samsung SmartThings Hub. However, if you plan to use it with Nexia, know that they have a monthly subscriber fee. Either way, if you already have an existing Z-Wave hub, all you need to do is to check compatibility. This smart door/window sensor looks actually just like the Ecolink competitor. And, it also has the sensor and magnet in package for installation. To further strethen similarity, they both offer the same color choices for the cover which is white and brown. One might not need much scrutiny to see the similarity in their overall visual package appearance. But who care, right? If they both are good Z-Wave door and window sensors then it’s a win-win for users. This smart device features a 3V Lithium CR123A battery with life expectancy of 2 years. If you’re concern about the placement of this device, it has a range of 50-100 feet and communicates within the Z-Wave radio frequency range of 908.42 MHz.However, this sensor is not intended to be used as a repeater within the Z-Wave network. And, it is intended for indoor purposes only. 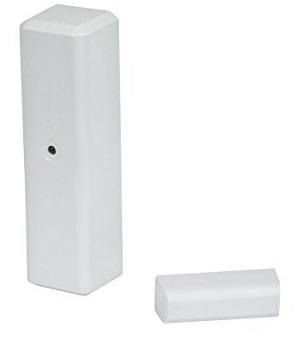 Above all of that, know that this sensor also needs to connect to a Z-Wave controller so you can receive alerts you needed for the activities at the door/windows of your home. This device has a little extra special feature for you which is an external switch connector. You can use this to connect an existing wired sensor so you can use instead of the magnet. This gives your wired sensor the Z-Wave functionality. This part of the device is undocumented but it sure provides a great value for flexibility. Aeotec may just have created the best Z-Wave door sensor in terms of form factor. 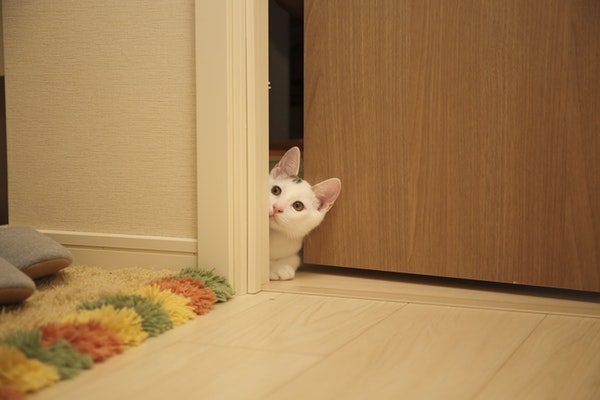 They call it the invisible door sensor because you can install it and hide within your door. 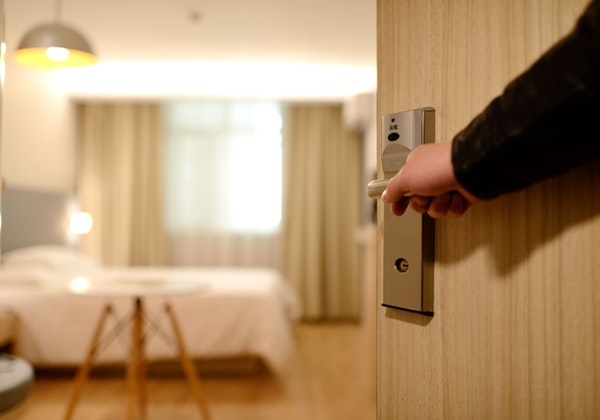 With its small and compact form factor of around 10 millimeters in width, it still offers the Z-Wave functionality for you to know if your door is open or closed. It designed thinking that the device should not change the visual aesthetic of your doors. So, if you want no trace of anything added in your door, Aeotec Recessed Z-Wave door sensor is perfect for you. It is relatively easy to install. You can hide this smart device through drilling a hole on top of you door. Hide it and then enjoy the benefits of having a smart door. In terms of connecting this to your Z-Wave network, you just have to activate its battery and synch it to your Z-Wave network. It can connect to up to 5 other Z-Wave devices. The Z-Wave chip in it provides a communication range of as much as 300 feet or 91 meters. Aside from that, it consumes low power and with a battery life of 1 year with its CR2 battery type. It also features low battery detection so you’ll know when to replace the battery. Manufactured by Fibaro, this modern Z-Wave door & window sensor provides the same functionality of monitoring the open/closed status of the doors and windows of your smart home. What’s good with this is that it can also be paired with DS18B20 Temperature Sensor to add temperature sensing feature. This door sensor can automatically trigger your pre-programmed scenes. It also has one potential free input which you can connect to a switch. This smart door sensor is among those which has the smallest form factor and with a thin design which will not cause so much addition in the visual appearance of your doors and windows. 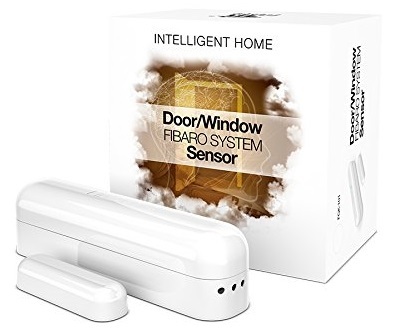 This Fibaro door/window sensor has 2 year of battery life and uses a CR123A battery which is the same with the other smart door/window sensors. It also features tamper protection so you’ll have additional peace of mind knowing that cases of tampering will not go unnoticed. You can use this sensor to monitor your doors, windows, safety gates and even roof windows. This sensor comes in with 7 different colors to choose from so you can match it with your home’s interiors design. This is by far the one which has the most flexibility in terms of color choice which will give you enough choices to match the colors of your door and windows. The design of the sensor definitely looks great and modern and the colors are elegant. This would look perfect in terms of aesthetic look. Another good choice for a Z-wave enabled sensor for your home’s door and windows is the Monoprice 10795 Z-Wave door/window sensor. This sensor mounts to a door or window so it can detect whenever it’s opened or closed. It sends the status signal to the Z-Wave network. These trigger signal can also be sent to other smart devices to trigger other programmed actions and tasks. 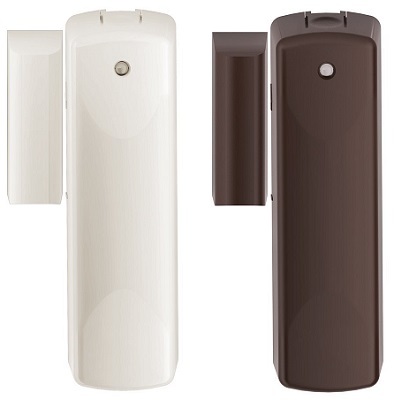 This smart door sensor supports Z-Wave plus and can be used as signal repeaters for the Z-Wave Plus network. This will help in expanding communication between other Z-Wave devices of smart home’s network. It is also backward compatible with other classic Z-Wave devices. 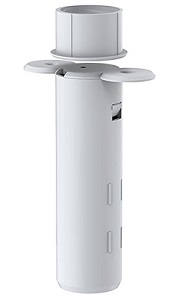 This devices is easy to install with the use of mounting screws. It also uses low power, as most Z-Wave devices do. We can only wish that when our door or windows open unexpectedly, it would be a cute little kitten looking for a home, right? But let’s take in the truth, this rarely and most likely won’t happen. However, there is a bigger chances that the unexpected visitors can compromise our security and the things we put up with hard work. So, it better we are making sure to do every thing to make our homes secure and know when danger might be coming so we can prepare. We know that one of the most important part of our homes to secure are doors and windows because they serve as gateway of our homes. So, how does door and window sensors actually work? How these sensors work rely on two things. First, the sensor and magnet relationship. Second, the very thing which makes these sensors smart which is the Z-Wave functionality. In simple terms, this is how the Z-Wave door and window sensors work. The sensor will detect if the door opens when the sensor is separated from the magnet. If not, then the sensor knows the door is closed. When the sensor senses that the door opens, it then sends signal or communicates with other smart devices like smart hub through Z-Wave communication technology. This is how these smart sensors operate. It simple but provides good benefits for the security and convenience of your home. Before you hit that buy button, we hope to provide you some guidance to what you should consider for a Z-Wave door and window sensor. These are the factors which might we think are important to check. We hope that this will help you and provide guidance. Z-Wave door and window sensors will report the status of doors and windows to the Z-Wave hub or controller which is at the heart of your Z-Wave network. Thus, these smart door/window sensors will need to be connected to a Z-Wave smart hub or controller. Therefore, it is extremely important that your sensor will have to be compatible with your smart hub. This should come in the most important factor to consider before you buy a Z-Wave door/window sensor. You can either read reviews of the sensors and you can find some other users who have used the sensor with the same hub as yours. Or, you can contact the sensors manufacturers support team and ask specifically about compatibility with your smart controller. The form factor of the door and window sensor should be taken into consideration. You have to consider where you will install it in your existing doors and windows. Aside from that, you should also consider how it will look when it is install. Will it be easily installed and will it not be easily removed or touched? The door and window sensors should fit the aesthetics of your door and windows and should be properly installed to make sure it will detect open/closed status accordingly. If you very particular with the design and aesthetic look of your home interiors, then you will find the color of the door and window sensors as well as how they can be placed in each of your doors and windows. Will it match or complement the design of your doors and windows? Will it not damage their aesthetic design? These could come in as factors in choosing the right Z-Wave door and window sensor for your home. Unless you are satisfied with just knowing the open/closed status of your doors/windows, you should be fine with having that functionality. However, if you are looking for more features from your door sensor, then consider knowing other features you can use for your needs. A good example is how many other Z-Wave devices does the sensor can send message to aside from the Z-Wave controller. You might want to trigger lighting when a door opens so you might want to connect it directly to a smart light switch. Or, you might want to send a message to your smart thermostat when the door opens. This would largely depend on your needs on what will happen if your door is opened or closed. Although, you can always control everything through your Z-Wave smart hub. Like, the smart door sensor will inform the smart hub and then the hub will be the one informing other smart devices on what will be done. This is a better solution. There are plenty of factors to consider before you decide to purchase any of these Z-wave door or window sensors. It all comes down to what price are you willing to pay and which feature will meet the needs of your smart home. Security and convenience will always be the greatest factors. Though price is also a consideration but you have a lot of options and these devices have average prices. It all comes down to the features you want and if it is worth the money you put in. So before you purchase any of these smart door and window sensors, carefully weigh in the thing you are looking for. The Ecolink Z-wave door/window sensor can provide you the simplest functionality for your home. But the other sensors in this list can also provide you similar functionalities. Either way, we hope that this have helped you find your choice from this list of the Best Z-Wave Door/Window Sensors for the doors and windows of your home. Best Z-Wave Garage Door Openers: Top Picks & Guide!